Most images of birds eating are set up by the photographer. This one is a documentary shot, with the bird having found its own nut and working on it on a random branch near the road I was walking along. Most decent images are the product of meticulous planning and careful execution – snapshots almost always look like snapshots. This is also true for this little series of snapshots, but they came out all right after all, and I thought I would share them. 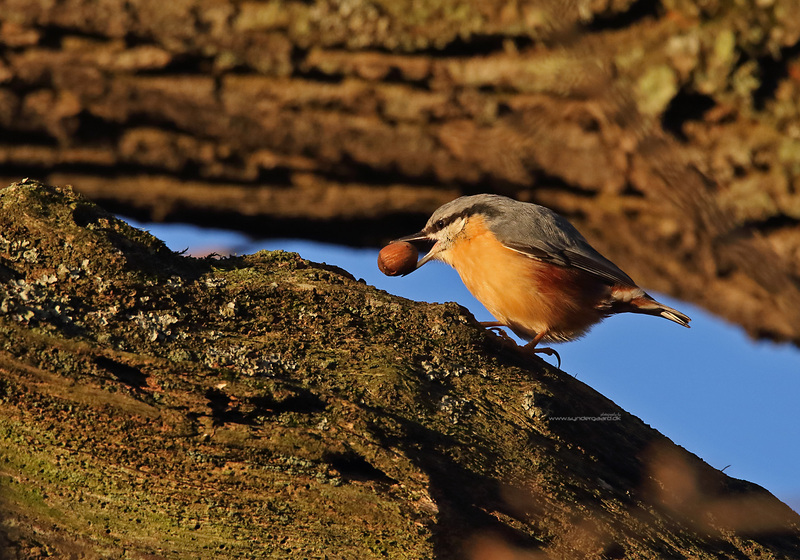 The Eurasian Nuthatch (sitta europaea) comes in two forms around here, the caesia and the europaea. The dividing line between the two is the Storebælt – the strait between my island (Fyn or Funen) and our “main” island (because it hosts the capital of Copenhagen), called Sjælland. On the E side of this divide the birds are paler and have an all-white breast with just some rufous colouring on the undertail, whereas our birds, from the caesia subspecies, are much more colourful. In these images the colours stand out even more, since the sun really is very close to the horizon – I have de-saturated quite a bit already to tone them down, but the light was golden-red that afternoon. A few minutes later I was taking pictures of the moon, as you can see. The moon is only a few days old. The plane flies into the red sunset and gets the contrails coloured for it, whereas the moon is completely uninfluenced by the hues of the light here on Earth.